While e-commerce startups offer some advantages to shoppers with cheaper prices, product variety and the convenience of shopping from home, it can arguably lag behind established offline stores and big box retailers in branding, personalized assistance and customer service, the ability to instantly get the product that was bought, and a showroom that enables the shopper to try out the product before buying the same. However, e-commerce startups can bridge these gaps and sharpen their value propositions by focusing on five key areas of online reputation, delivery and logistics, warranty and returns, customer service support and shopping experience. 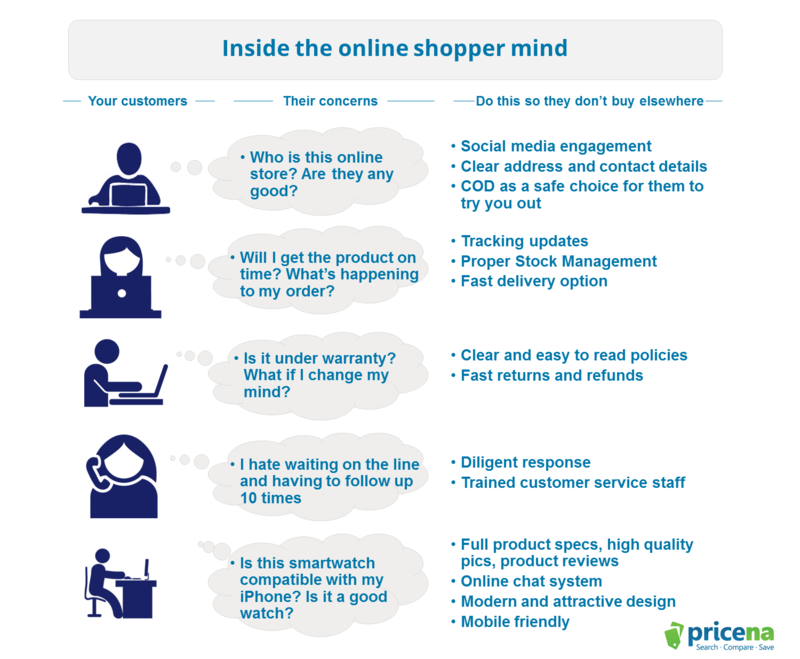 This article discusses the online shoppers’ “concerns” in each of these areas, the offline commerce advantage, and the practical ways e-commerce startups can give themselves an edge and attract offline shoppers their way. Start building your brand reputation online. Establish a social media presence on Facebook, Twitter, Linkedin, Pinterest and other platforms. Customers need to be able to easily get information about your store and connect with you when needed. Diligently reply to public social media inquiries, be it on your Facebook page, Google reviews, or on Twitter- this shows you are active on social media and cater to your customer support requests. Encourage your customers to write reviews for your store on marketplaces and Google reviews. Show a physical address for your company clearly on the site. Have a physical address and contact details of the company clearly mentioned on the website. This way, customers can rest assured that you are a licensed company with a local presence. List your store with other established online marketplaces. This helps you in getting store reviews and building your reputation, while still building your online brand through your own website. Offer cash on delivery (COD). Many people argue whether COD is serving or actually hurting e-commerce in MENA. The reality is that e-commerce is still nascent in this region, and there are still many areas of improvement in getting the right product on time to the customer. For this reason, shoppers prefer COD as it’s a safer option and provides an easier way to cancel the order in case it is delayed by the store, or the product turned out to be out of stock, without worrying about the refunds process. Give your customers some time to build trust and offer them their preferred payment method. Once trust is built, customers won’t have an issue with online payments. Keep your customers updated about their orders. Always provide updates about the order status. If a customer makes an order and they don’t hear from you, they will keep wondering whether the order was received or not. Tracking doesn’t have to be sophisticated. An email that confirms receiving the order, having the product in stock, and out for delivery is enough to ease your customer’s mind. Proper stock management. Always update your stock properly to avoid unfulfilled orders. In a physical store, the product is right there and it’s available, and this should be the same case for online retailers as well. It will be hard for a disappointed customer to try you again once they find out that there is a 50-50 chance the item they want is actually in stock. Have fast delivery options available. Even if this means extra fees, it gives shoppers an option to have their orders delivered faster, and also helps your store attract them away from physical stores. You can offer two delivery options with different charges, and leave the choice to the buyer. Provide clear and easy to read policies. Avoid saying “this is handled on case by case basis.” Have a clear policy and commit to it. If warranty varies per product, highlight it clearly on the product page. As a best practice, key warranty and return information should be clearly highlighted on the product page next to the buy button, and not within a separate FAQ page. This also increases conversions, especially if the warranty or return terms are generous. Avoid unnecessary delays in the return, repair or refund process. With physical stores, customers can visit them anytime to return a product. For online stores to match that service, you’d need to be fast in handling returns, otherwise the customer will always prefer to shop offline. Be diligent in answering customer service requests. Have a hotline available for client queries and be available through email, online chat, and other support channels. Always be available- if you are easily accessible, then you become almost like a physical store. If customers cannot call you, or has to wait to get in touch with you for a long time, then you might lose their trust, which does not bode well for repeat visits. Train your customer service staff on how to handle every scenario. Avoid saying, “We’ll call you back.” Try to address the issue on the spot. In exceptional cases where you need to check on something, do call the customer back on time. Nothing upsets the customer and ruins the trust more than not receiving the call back! Have a modern and attractive design. Avoid the 1995 web 1.0 look and feel! More importantly, the site should be fast enough to provide a smooth experience. Optimize your site for mobile. Shoppers should be easily able to browse through your site and complete purchases on their smartphones. The design should fit their phone screen, and navigation elements and buttons should be of the adequate size. Showcase all the requisite information. Provide full product specifications, high quality pictures and product reviews to give shoppers as much information as possible about the product and thus help them decide if this is the exact product they are looking for. Make it easy for customers to contact you. Implement an online chat system where shoppers can get answers for any questions regarding a product or your store policies. Finally, remember to always think from a customer perspective, and address all of their concerns. Stiff competition leaves no room for a sub-par customer experience. 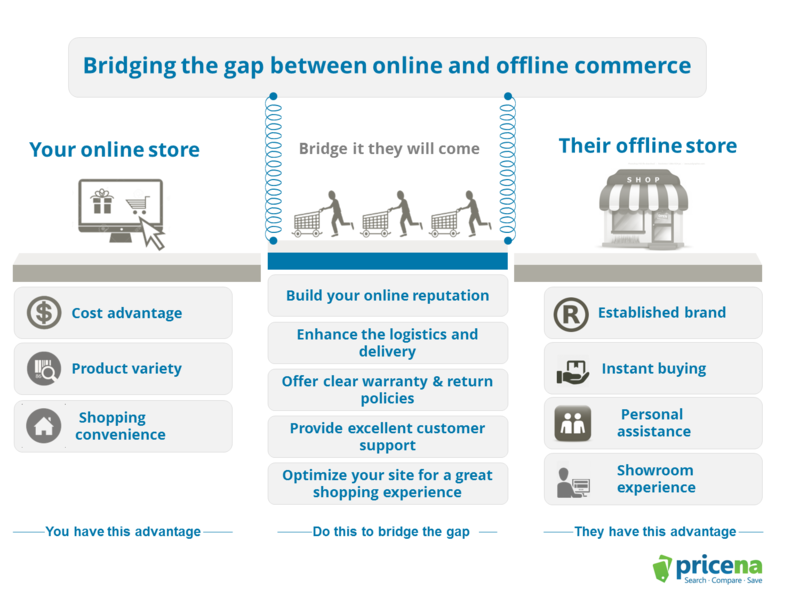 Addressing the above areas will enable your e-commerce startup to address the gaps and effectively compete with the offline stores- bridge those gaps, and they will come!